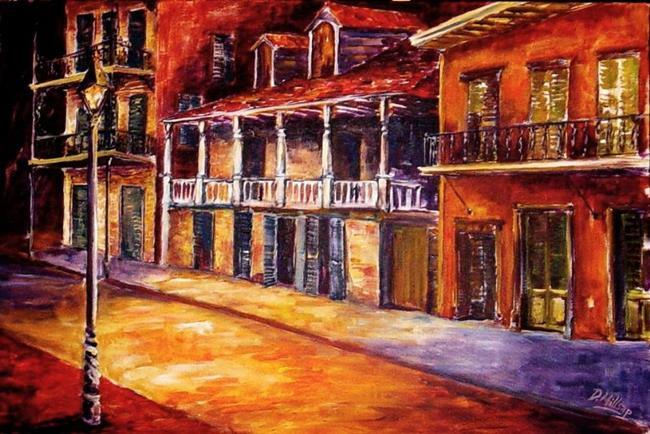 The old street lights cast a mysterious glow on the streets of the old French Quarter. This large street scene, measuring 36" x 24," is mounted on stretcher bars and is ready for framing. If you choose to hang it unframed, the edges of the canvas are painted. A convenient picture wire kit is included for instant hanging. This is a one-of-a-kind orginal, not a print, and will come with Diane's certificate of authenticity.